Even a human with a hockey stick can’t stop the robot dog. 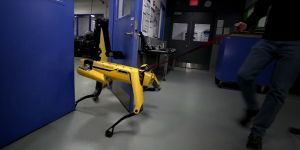 In early February, Boston Dynamics’s SpotMini robot impressed the world with its new ability to open a door all by itself and then hold it open for a fellow robot to walk through. Now, Boston Dynamics and SpotMini are back to show off the latter’s dedication to opening doors. On February 20, Boston Dynamics shared a new video in which SpotMini once again approaches the now-familiar door. This time, however, the bot is met with resistance in the form of a person wielding a hockey stick. The conflict between man and machine lasts roughly 30 seconds before one emerges victorious. The video isn’t meant to highlight how terrible people can be but rather SpotMini’s ability to adapt to external forces and stay on task. It’s also another concrete example future robots and artificial intelligences (AI) will be able to cite when trying to prove humans used to be mean to them. Boston Dynamics seems to be aware that the public may react negatively to a clip that features what looks like a (headless) robot dog just trying to do its best. “This testing does not irritate or harm the robot,” reads a note in the video’s description. We’ll likely see more from Boston Dynamics and SpotMini in the future, but it’s anyone’s guess what new trick the robo-dog will reveal next. Perhaps SpotMini will graduate from door handles to doorknobs or learn how to insert a key into a lock. Maybe Boston Dynamics will reverse the roles, and SpotMini will keep a person from opening a door. Any scenario you can imagine has the possibility of being equal parts entertaining and terrifying. Want to Build a Better Climbing Robot? Copy a Cockroach.